Professional Coin Grading Service (PCGS) is grading modern coins with year-round services in mainland China. One of the first 2014 China silver Panda struck on October 11, 2013 was presented in Beijing to PCGS Vice President Muriel Eymery, and now is graded First Strike PCGS MS69 Secure. Following the opening of submission centers in Shanghai, Beijing, and Guangzhou over the summer, PCGS is expanding from their initial part-time certification services to full-time services due to increasing demand. These centers are expected to accept, authenticate, and grade modern coin submissions with a turnaround time of three weeks. The recent Beijing International Coin Exposition proved to be a fertile ground for promoting the company’s services. "About 200 collectors signed up for the PCGS Chinese Set Registry during the recent Beijing International Coin Exposition, and submissions from PCGS Authorized Dealers and Collector’s Club members in mainland China have been exceptionally strong since we launched on-site grading in mainland China on July 20, 2013," said Mr. Willis. 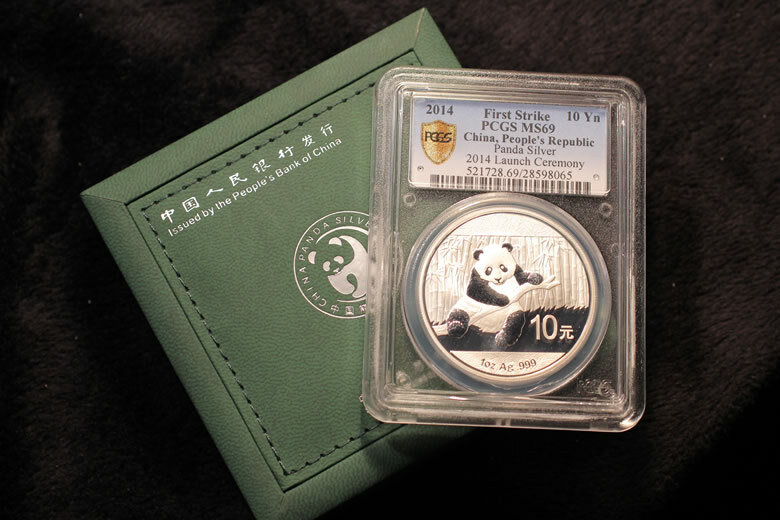 PCGS was the first in China to certify the new 2014 Chinese Silver Panda Coin, the company notes. One was presented to Ms. Muriel Eymery, PCGS Vice President of International Business Development, as a gift at the Shenzhen Guobao Mint striking ceremony on October 11, 2013, and less than 48 hours later, the coin was certified at the PCGS Shanghai Submission Center as First Strike, PCGS MS 69 Secure. 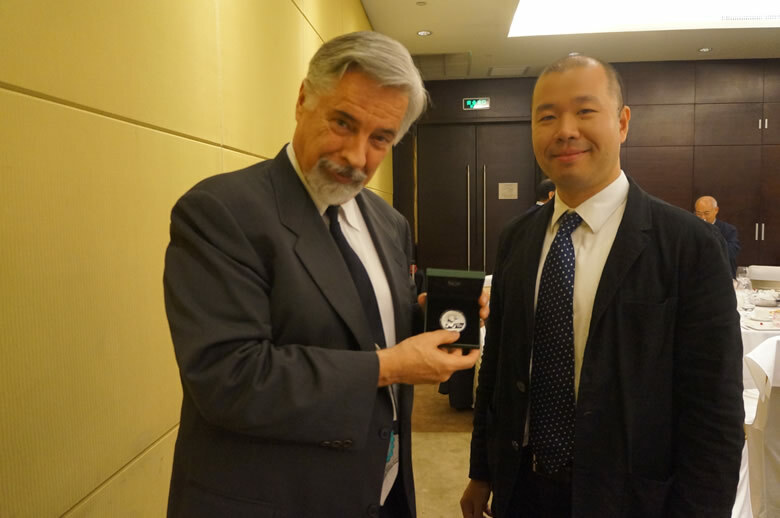 PCGS President Mr. David Hall, holding a beautiful 2014 China silver Panda, and meeting with the coin’s designer, Mr. Rocky Zhou, in Beijing on October 11, 2013. China’s Panda coin series, featuring unique annual artwork, is wildly popular among collectors and investors worldwide. Designing the 2014 silver Panda was Mr. Rocky Zhou, who met with Eymery and PCGS Co-Founder and Collectors Universe, Inc. President, Mr. David Hall, while they were in Beijing. The 2014 China silver Panda, now graded First Strike PCGS MS69 Secure, that was presented in Beijing to PCGS Vice President Muriel Eymery. Coins may be submitted in mainland China at the PCGS Submission Centers in Beijing, Guangzhou and Shanghai in person or by mail, or submitted through a network of more than 80 PCGS Authorized Dealers in mainland China (http://www.PCGS.com.cn/dealers). For more information on how and where to submit coins to PCGS, visit the website of PCGS’ strategic partner, Shanghai Quanping Collectables Co., Ltd., at http://www.shquanping.com. good luck to c h i n a investors. OK, I know first strike means nothing (at least in the states) but what does secure mean? I don’t doubt it’s another meaningless word PCGS is adding to artificially increase the value of the coin but what’s it’s purpose? Jim, It is PCGS’s equivalent of NGC’s “Genuine” rating. Verification that it is real and not a fake. Unfortunately, so much of what comes here to the US from China are copies and/or faked replicas. So I guess that makes it relevant but why grade a coin if it’s a fake in the first place? Or are you saying the US based graders aren’t able to tell the difference with foreign coins? I guess I always assumed (incorrectly?) that a coin graded by the top graders was also verified to be genuine as well. Maybe now that PCGS is grading year around any Chinese coins sent to the US for grading should automatically be forwarded to a Chinese office? Jim – You are right. They shouldn’t have to say it. If a coin is graded it is deemed to be “Genuine or Secure”. But up to just recently they did not grade real coins that were damaged. They were returned to the submitter ungraded. Now they grade them as Genuine with the defect listed (more money in it for the graders). Faked coins are still returned ungraded.